The main street of Montauville gives, perhaps, a characteristic glimpse of the life of the soldier on active service, who is not actually taking his turn in the trenches. He is under the shade of every wall; lounges in every doorway, stands in groups talking and laughing. His hands and face and neck are brown with exposure, his heavy boots, baggy trousers, and rough coat are stained with mud from bad weather. He laughs easily, is interested in any trifle, but underneath his surface gayety one may see the fatigue, the bored, the cynical indifference caused by a year of war, torn from every human relationship. What can be done to humanize his lot, he does with great skill. He can cook. Every cottage is full of soldiers, and through open doors and windows one sees them eating and drinking, talking, playing cards, and sometimes, though rarely, they sing. In the evening they stand in the street in great numbers, and what with that, the difficulty of making ears accustomed to shrapnel take the sound of a motor horn seriously, and the trains of baggage wagons, ammunition for the guns, carts loaded with hay, etc., it is not too easy to thread one's way along. In our early days here curiosity as to who and what we were added to the difficulty, crowds surrounding us whenever we appeared, but by this time they are used to us, and not more than a dozen at once want to come and talk and shake hands. Perhaps the most interesting time to see Montauville is when, after a successful attack by the French, the German prisoners are marched through the village. These, of course, without weapons and with hands hanging empty, walk with a dogged step between guards with fixed bayonets, and as they pass, all crowd near to see them. Almost invariably the prisoners are bareheaded, having lost their caps --- these being greatly valued souvenirs --- on their way down from the trenches. They are housed temporarily, for interrogation, in a schoolhouse in the main street, and when they are lined up in the school-yard there is a large crowd of French soldiers looking at them through the railings. Afterwards, they may be seen in villages behind the lines, fixing the roads, or doing similar work, in any old hats or caps charity may have bestowed upon them. On Thursday, the 22d, we had a quiet day. In the evening several of us stepped across to the house where Smith and Ogilvie lived, to have a little bread and cheese before turning in. They had brought some fresh bread and butter from Toul, where duty had taken one of them, and these being our special luxuries, we were having a good time. Coiquaud was at the Bureau and two or three of our men were in or about the caserne. There were nine of us at the house at the fork of the road, which, no doubt, you remember. Suddenly as we sat round the table there came the shriek of a shell and a tremendous explosion. The windows were blown in, the table thrown over, and all of us for a second were in a heap on the floor. The room was full of smoke and dust. None of us was hurt, happily, except Holt, who had a cut over the right eye, and who is now going about bandaged like one of our blessés. We made a scramble for the cellar, the entrance to which is in a courtyard behind the house. As we were going down the stairs there followed another shell, and quickly on top of that, one or two more, all very near and pretty heavy. We stayed in the cellar perhaps ten minutes, and then, as I was anxious to know how things were at the caserne, I went up and, letting myself out into the street, ran for it, seeing vaguely as I passed fallen masonry and débris. The moon was shining through the dust and smoke which still hung a little thick. When I got to the caserne, the first thing I heard was Coiquaud crying, "Oh! pauvre Mignot!" and I was told that the poor fellow had been standing, as was his wont, in the street, smoking a pipe before going to bed. He was chatting with two women. Lieutenant Kullmann's orderly (I think they call him Grassetié) was not far away. The same shell which blew in our windows killed Mignot and the two women, and severely wounded Grassetié, who, however, was able to walk to the caserne to seek help. He was bleeding a good deal from several wounds; had one arm broken; his tongue was partially severed by a fragment which went through his cheek. He was taken immediately, after a rough bandage or two had been put on, to try to cheek the loss of blood from his arm, where an artery appeared to be severed, to Ambulance N° 3 at Pont-à-Mousson, whence he was afterwards taken to Dieulouard and to Toul. He will probably recover. [Editor's note: He died soon after.] A boy, the son of our blanchisseuse, who was wounded at the same time, will, it is feared, die. As I was told that Mignot still lay in the street, I went out again, and saw him lying, being examined by gendarmes, on the pavement. He seems to have been killed instantaneously. The contents of his pockets and his ring were taken from the body by Coiquaud and handed to me: they will, of course, be sent to his wife. He leaves two children.... Poor Coiquaud, who had shown great courage, became a little hysterical, and I took his arm and led him back to the caserne. When we all, except those who had left with Grassetié and some who had taken Mignot's body to Ambulance N° 3 (there was such confusion at the time and I have been so constantly occupied since I don't yet know exactly who took that service), collected at the Bureau, our jubilation at our own escape --- if the shell had travelled three yards farther it would have killed us all --- was entirely silenced by the death of Mignot, for whom we all had a great affection. He served us well, cheerfully from the beginning, honestly and indefatigably. He was a good fellow, possessing the fine qualities of the French workman to a very high degree. A renewed bombardment broke out about this time, and we went down to the cellar. A shell striking the roof of one of our houses knocked in all our windows. I think we may all honestly confess that by this time our nerves were rather shaken. I was specially anxious about the cars in the barn, including the Pierce-Arrow and the Hotchkiss. One shell falling in the midst of them would have crippled half our cars ---and if an attack on Bois-le-Prêtre had followed ...! Our telephone wires were broken, so we were isolated. Lieutenant Kullmann and I decided, after consultation with all our men who were present, to report the situation to the médecin divisionnaire. So long as our men kept in the cellar they were safe enough. The Lieutenant and I left in the Peugeot brought by him to the Section, our leaving chancing to coincide with the arrival of four or five fresh shells. It was nervous work driving out; fragments of tiles and of shells --- the latter still redhot --- fell about us but without hitting us. After seeing the médecin divisionnaire we returned to the caserne and spent the rest of the darkness in the cellar. From time to time more shells came, but soon after daybreak the firing ceased. In the morning we were very anxious for a while about Ogilvie. He had, unknown to the rest of us, gone to sleep at Schroder's and Buswell's room, and in the night two more shells struck his house, one of them penetrating right through to the cellar, making complete wreckage there. Some of us spent a little time looking in the débris for his body. You would have been very moved if you could have been present at poor Mignot's funeral. We did what we could for him to show our respect, and I concluded I was only carrying out what would be the wishes of the American Ambulance by authorizing the expense of a better coffin and cross than he was entitled to in his grade in the army. At eight in the evening as many men as were off duty went to Pont-à-Mousson to attend the funeral. A short service was read in the chapel of the Nativité. There were four coffins: Mignot's, covered with a flag and with many flowers, and those of three civilians, killed on the same evening. It was a simple and impressive ceremony: the dimly lighted chapel, the dark forms of some twenty or thirty people of Pont-à-Mousson, our men together on one side, the sonorous voice of the priest, made a scene which none of us can forget. Colonel de Nansouty, Commandant d'Armes de Pont-à-Mousson, and Lieutenant Bayet were present; and when the little procession was formed and we followed the dead through the darkened streets and across the Place Duroc, they walked bareheaded with us. At the bridge the procession halted, and all but Lieutenant Bayet, Coiquaud, Schroder, and the writer turned back, it being desired by the authorities that only a few should go to the cemetery. We crossed the river and mounted the lower slope of the Mousson hill. Under the trees in the cemetery we saw as we passed the shattered tombs and broken graves left from the bombardments, which even here have made their terrible marks. In a far corner, well up on the hillside, the coffin of Mignot was laid down, to be interred in the early morning. We walked quietly back in company with Lieutenant Bayet, and were at last free to rest, after so many hours of unbroken strain. On the 3d of May N° 6 went back on me for the first time. I was returning from Toul when the car broke down in half a dozen different places at once. I could not fix it, but would have reached Dieulouard on three cylinders if it had not been for a steep hill. Twice N° 6 nearly reached the top, only to die with a hard cough and slide to the bottom again. On account of this hill I was forced to walk fourteen kilometres to Dieulouard for help. The next night I had my first experience at night driving. A call came in at half-past nine to get one wounded man at Clos Bois. McConnell, driver of No 7, went with me. We neither of us bad ever been there, so it was somewhat a case of the blind leading the blind. It made little difference, however, as the night was so black that nothing but an owl could have seen his own nose. We felt our way along helped by a distant thunderstorm, the flicker of cannon, and the bursting of illuminating rockets, picked up our wounded man, and were returning through Montauville when we were stopped by an officer. He had a wounded man who was dying, the man was a native of Dieulouard and wished to die there, and the officer asked us to carry him there if the doctor at Pont-à-Mousson would give us permission. We took him. He had been shot through the head. Why he lived at all I do not know, but he not only lived, but struggled so hard that they had to strap him to the stretcher. When the doctor at the hospital saw him, he refused to let us carry him to Dieulouard because the trip would surely kill him and he might live if left at the hospital. Whether he did live or die I was never able to find out. Our life here is one of high lights. The transition from the absolute quiet and tranquillity of peace to the rush and roar of war takes but an instant and all our impressions are kaleidoscopic in number and contrast. The only way to give an impression of what takes place before us would be a series of pictures, and the only way I can do it is to describe a few incidents. Sometimes we sit in the little garden behind our caserne in the evening, comfortably drinking beer and smoking or talking and watching the flash of cannon which are so far away we cannot hear the report. At such times, the war is remote and does not touch us. At other times, at a perfectly appointed dinner-table, laden with fresh strawberries, delicious cakes, and fine wine, and graced with the presence of a charming hostess, the war is still more distant. Pont-à-Mousson, moreover, is rich in beautifully conceived gardens of pleasant shade trees, lovely flowers, and tinkling fountains. Lounging in such a place, with a book or the latest mail from America, the war is entirely forgotten. Yet we may leave a spot like that and immediately be in the midst of the realities of war. One evening, about seven-thirty, after the Germans had been firing on Pont-à-Mousson and the neighboring villages for some hours, I was called to Bozeville. This village, which is on the road to Montauville is a small cluster of one-story brick and frame buildings constructed in 1870 by the Germans for their soldiers. When I reached this place it was on fire, and the Germans, by a constant fusillade of shrapnel shells in and around the buildings and on the roads near them, were preventing any attempt being made to extinguish the fire. To drive up the narrow road, with the burning houses on one side and a high garden wall, thank Heaven, on the other, hearing every few seconds the swish-bang of the shells, was decidedly nervous work, anything but peaceful. After picking up the wounded, I returned to Pont-à-Mousson, where conditions were much worse. At this time the Germans were throwing shells of large calibre at the bridge over the Moselle. To reach the hospital to which I was bound, it was necessary to take the road which led to the bridge and turn to the left about a hundred yards before coming to it. Just as I was about to make this turn, two shells struck and exploded in the river under the bridge. There was a terrific roar and two huge columns of water rose into the air, and seemed to stand there for some seconds; the next instant, spray and bits of wood and shell fell on us and around us. A minute later I turned into the hospital yard, where the effect, in the uncertain and fast-fading light, was ghostly. Earlier in the evening a shell had exploded in the yard and had thrown an even layer of fine, powder-like dust over everything. It resembled a shroud in effect, for nothing disturbed its even surface except the crater-like hole made by the shell. On one side of the yard was the hospital, every window broken and its walls scarred by the pieces of shells; in the middle was the shell-hole, and on the other side was the body of a dead brancardier, lying on his back with a blanket thrown over him. He gave a particularly ghastly effect to the scene, for what was left of the daylight was just sufficient to gleam upon his bald forehead and throw into relief a thin streak of blood which ran across his head to the ground. Needless to say I left that place as quickly as possible. Another scene which I do not think I will soon forget happened in Montauville. It was just after a successful French attack and shows war in a little different light, with more of the excitement and glory which are supposed to be attached to battle. Montauville is a straggly little village of one- and two-story stone and plaster houses built on the two sides of the road. It is situated on a saddle which connects one large hill on one side of it with another large hill on the other side of it. It is used as a dépôt and resting-place for the troops near it. On this particular day the French had attacked and finally taken a position which they wanted badly, and at this time, just after sunset, the battle had ceased and the wounded were being brought into the poste de secours. The tints of the western sky faded away to a cloudless blue heaven, marked here and there by a tiny star. To the south an aeroplane was circling like a huge hawk with puffs of orange-tinted shrapnel smoke on all sides of it. In the village the soldiers were all in the streets or hanging out of the windows shouting to one another. The spirits of every one were high. They well might be, for the French had obtained an advantage over the Germans and had succeeded in holding it. 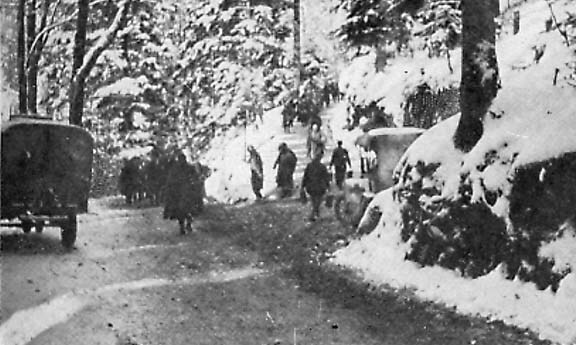 A French sergeant entered the town at the lower end and walked up the street. At first no one noticed him; then a slight cheer began. Before the man had walked a hundred yards, the soldiers had formed a lane through which he strode. He was a big fellow, his face smeared with blood and dirt and his left arm held in a bloody sling. On his head was a German helmet with its glinting brass point and eagle. He swaggered nearly the entire length of the village through the shouting lines of soldiers, gesticulating with his one well arm and giving as he went a lively account of what happened. Some one started the "Marseillaise" and in a few minutes they were all singing. I have heard football crowds sing after a victory and I have heard other crowds sing songs, but I have never heard a song of such wild exultation as that one. It was tremendous. I wish the Germans could have heard it. Perhaps they did! They were not so far away, and the sound seemed to linger and echo among the hills for some minutes after the last note had been sung. Our work here on this sector of the front is about three kilometres in length. We do it all, as there are no French ambulances here. We usually carry in a week about eighteen hundred wounded men and our mileage is always around five thousand miles. The authorities seem to be pleased with our work and we know that they have never called for a car and had to wait for it. At any rate, we have had the satisfaction of doing the best we could. Several bombardments have taken place near the first-aid posts and hospitals where our cars are on duty. On the 6th, the Germans bombarded a road that runs along the top of a ridge several hundred yards from the post at Huss. One of the first shells landed on a farmhouse just below the road, in which some Territorials were quartered, killing three of them and wounding five others. Two of our men, accompanied by the médecin auxiliaire of the post, immediately drove their cars over to the farm and rescued the wounded while the bombardment was still going on. As a result of this prompt and courageous action on their part, all three men were cited in the order of the division and will receive the Croix de Guerre. October 26. The head of the Sanitary Service of the French Government, accompanied by three generals, made a tour of inspection of all the units in this Sector to-day. Mr. L----, accompanied by Lieutenant K -----, went to B-----, where a formal inspection was held. Mr.L----- was thanked as Section Commander for the service rendered by Section Sanitaire Américaine No 2. The remarks were exceedingly complimentary. General L---- and the médecin divisionnaire, who accompanied the party as representatives of the Sanitary Service in this Sector, added their compliments to those of General L-----. November 14. We had the first snow of the season to-day. All the morning it snowed and covered the fields and trees with a thick coating of white. In the roads it melted and they became stretches of yellow slush. B---- broke his arm cranking his car this morning, He will be out of commission for three weeks, so the surgeon who set it informed him. November 16. We received a phone message in the morning asking us to go to the "Mairie" to meet a high official. Four of us went over. A number of large cars were drawn up in the Place D -----. One bore the flag of the President of France. We were to meet Poincaré. We formed a line inside the sandbag barricaded arcade. The President and his entourage passed. He stopped in front of us. "One finds you everywhere," he said; "you are very devoted." Then he shook hands with each of us and passed on. We wandered on down the arcade to watch the party go down into the shelled area of the town. A sentry standing near us entered into conversation. He addressed himself to Pottle: "Did he shake hands with you?" he asked. "Oh, yes," replied Pottle. "Hell,"' said the sentry; "he is n't a bit proud, is he?" November 25. Thanksgiving--- and we celebrated it in the American style. We had purchased and guarded the turkeys, and they were prime. C----- did wonders with the army food, and it is doubtful if any finer Thanksgiving dinner was eaten any place in the world than the one we enjoyed two thousand yards from the Huns. November 26. An enemy plane, flying high above us this morning, was forced to make a sudden descent to a height of three hundred metres from earth. He was either touched by shrapnel or his mixture froze and he had to seek a new level. He passed very low over us. One of the Frenchmen attached to our Section fired at him with a rifle, but did not get him. November 30. B---- was shelled and a few stray shots were sent into town and on the troop roads near us. Under S ---- the meals have been sumptuous repasts and we marvel at the change. The writer, with two others of the Section, was crossing the Place --- after dark. As we passed the breach in the sandbag barricaded roads made by Rue ---, we were lighted up by the yellow glare coming from the shops next to the "Mairie." The sentry thereon duty saw us. "Pass along, my children, and good luck --- you are more devoted than we are," he cried to us. I was startled by the voice out of the darkness and the surprising remarks. I glanced towards the sentry's post, but the light blinded me and I could not see him. From his voice I knew he was old one of the aged Territorials.
" Oh, no!" I answered, for lack of anything better to say. "Yes, you are. We all thank you. You are very devoted," he said. "No, not that, but I thank you," I said; and we were swallowed up in the darkness. Then I was sorry one of us had n't gone back to shake hands with the kind-hearted old fellow. It seemed to me that it was the spirit of France speaking through him, voicing as usual her appreciation for any well-intentioned aid, and that we should have replied a little more formally. November 13. A bad number and a grim day for 168. At daybreak one blessé, one malade, to Moosch. Brake loose as an empty soap-bubble. Endless convoy of mules appeared at bottom of hill. Tail-enders received me sideways or full breach --- could n't stop --- did n't think to put on reverse, so did some old-fashioned line-plunging. Heard cases crack, men swear, mules neigh, but heard no brake taking hold. Tried to stop later, but only succeeded in doing so by dragging against bank, which was so straight car rubbed along like an old elephant scratching its cutlets, and padlocks, keys, tools, side-boxes removed like flies. Incidentally a young army on the way up the hill ---a few casualties if I had not stopped. Tornado of rain. A big tree had fallen across the road this morning --- just got under it --- had been chopped down on the way back. Nothing doing since, but frightful weather --- good chance to write in diary --- most devilish wind in P.M. Walked over to Bain-Douches in the evening to see Hartmann's by night by star bombs, but weather too bad and saw no bombs. The valley of the Rhine so near our feet --- impossible to realize that somewhere between us and that flat vast plain, with all its villages alight at night, were both lines of trenches --- yet the trees only moved in the wind and the only noise the batteries to the rear. November 14. Got up about an hour earlier than any one else, looked out to find trees covered with snow --- most splendid. The two Fords snowed into the background. Built fire for sleeping sluggards. Took two "birds" and one brancardier down the hill --- brakes refused to work --- used reverse successfully --- no mules slaughtered or even touched --- oxen in the way, of great service --- dropped my men at Moosch. Blow-out just pulling into Wesserling with two malades --- let 'em walk --- put on new tube --- also blew out --- ran into hospital --- put on new tire --- no lunch. November 15. Cold and clear, mountains amazingly fine --- was orderly. Tried to move an eight-story Boche stove with Carey from wall to centre of room where heat might radiate more effectually --- weight two tons --- toppled like Tower of Pisa. I held it one second saving Carey's life after imperilling it first --- just got out before the whole damn shooting-match crashed to floor a mass of broken cast-iron, broken baked clay, and ashes. With great patience and science utilized lower stones still standing by fixing top, shortening pipe, etc. Now in centre of room where one can sit, talk, read, etc. Two vain trips with Carey to see Burgomaster to report catastrophe. November 17. Snowing to beat hell. All hands to Bussang to evacuate hospital --- minus usual sumptuous repast. Fenton moved rear roller of his boat in usual dashing style --- came around the corner a minute later with conservative momentum and received from master-mechanic a severe dissertation on overspeeding, etc., standing on his own ruins as he spoke. Got late to Krüth --- found Douglass there --- then eased victuals into us at the "Joffre" --- six eggs in my inner tube. Took three frozen feet to Bussang. We slipped as skating-rink camions stuck all along the line --- snow packed in hard. 168 ran poorly on way back --- slow going on slippery road --- the col magnificent --- trees loaded with fresh snow. December 3. To Thoms --- enormous amount of heavy artillery on the road --- eternal convoys of mules on way up. Kept getting stuck --- finally got through --- found Galatti --- terrible weather, road sea of mud, mountain torrents across it. In the afternoon we each took down a load of four ---difficult driving --- so tired when we got to Moosch. We had dinner there. My carbide worked feebly, so G. followed with electric lights to show me the way. On steep grade after zigzag I stuck --- backed into bank. G. thought he had callé'ed his wheel, but voiture rolled downhill into the gutter. An hour's hellish pushing, cranking, etc., of no avail. Finally I got out a trench spade and dug away bank and he backed --- some tringlots came by and we pushed him up. Next assault was on steep turn. G., having burned out his electric lights trying to get out of gutter, went ahead of me with his barnyard lantern on bowsprit. He missed the road. I slowed up and we rested side by side, neither daring to lift the toe on the brake. Finally G. backed into a frightful hole --- got out, callé'ed my voiture, and we went in and routed up some charbonniers in some log cabins off the road --- two cabins full --- got out of bed with most charming grace and pulled the car out and we finally got back --- three hours from Moosch to there --- très tired, tous les deux. December 7. Hung around expecting to leave early to-morrow --- took a contagious call in Hall's car, mine being chargée, to Wesserling, where at the end of the valley between the mountains three avions were flying around --- two French, one German. The sky clear for once and, lit by sun about to sink over Ballon d'Alsace, was studded with white shrapnel puffs---while the German puffs were flaked into black clouds. On the way to Bussang with my contagious passed Hill who yelled, "We stay." January 9. Took Maud [the name of his car] out in the morning with Hill at the wheel. ---Went first to Moosch then back by Urber to test hill. Maud pronounced fit for military burial after Hill's autopsy. In P.M. made inventory of Mellen's old car to take out to-morrow. Bad dreams at night about Thoms. January 10. Nightmare of last night not up to actuality. Got up with Mellen's car at Thoms after sticking first short of watering-trough. Cate and I had a stake to plant at the place where Hall fell and start a cairn of stones. At watering-trough, just as I started up, a shell lit near and caused a rush of air by my head. As we planted the stake and gathered stones shells whistled round. Mellen's car a heller to crank. Arrived at Thoms finally sweating blood under my steel casque in spite of temperature --- about zero. Found Suckley, Phillips, Carey and Cate present. Carey and Phillips went to Paste for wounded --- Suckley to Herrenfluh --- Cate and I left alone. Shell N° 1 arrives --- every one to abri --- Cate and I stay outside in kitchen. Bombardment of about half an hour or three quarters ---can't judge. Last shell sent window, door, and stove in on us and blew us off the bench. Peeped into the next room. All blown to hell --- shell had landed just to right of entrance.... A very low P.M. Rice came tearing up from Henry's a minute or so after the bombardment. I saw one hundred yards of messed-up wire moving mysteriously down the road ---was attached to Rice's car. He hurdled scalloped tin, etc., where tringlots had been killed. Cate coolest man in Christendom --- was reading account of sinking of Lusitania when last shell arrived --- just at part where torpedo struck.... When some wounded came in on mules I parted with extreme pleasure. The most anxious drive I ever had in a checkered automobiling experience was in the evening of September 30. It was at a new post in the mountains, not far from Hartmannsweilerkopf. I was there for the first time when a call came from ---- (a station just behind the lines where a shower bath is established). It was dusk already, but I knew no better than to start. The road is new since the beginning of the war; it follows the steep route of an old path and no lights are allowed on it for fear the Germans might locate and shell it. It is narrow, winding, and very steep, so steep that at places at the top of a descent it looks as if the road ended suddenly. There was barely enough twilight through the mass of trees to allow me to see the pack-mules returning from the day's ravitaillement, but I finally made my way to the post. I was given a poor, blind soldier to carry back. What a trip he must have had. If it was trying for me, it was worse for him. It was now dark, a moonless, starless night in the woods. When I started back, I could seldom see the road itself. I had to steer by the bank or by the gaps in the trees ahead. Occasionally I would feel one of the front wheels leave the crown of the road, and would quickly turn to avoid going over the precipice, but with all this I had to rush the grades which I could not see, but could only feel. At last the machine refused a hill and stalled. I knew that there were steeper hills ahead, worse roads and thicker woods. I decided that a German bullet would be better than a fall down the mountain-side, and so I lit one of my oil lamps. Some passing soldiers gave me a push and by the flickering light of the lantern I felt my way more easily back to the post. I was glad to arrive. A few more hours and the steady line of ambulances began its journey downward to crawl up again for another load, always waiting. We deposited our wounded at the first hospital in the valley --there the British took them and moved them on towards France. During that first night and day the wounded men could not filter through the hospital fast enough to let the new ones enter. Always there were three or four Fords lined up before the door, filled with men, perhaps dying, who could not be given even a place of shelter out of the cold. And it was bitterly cold. 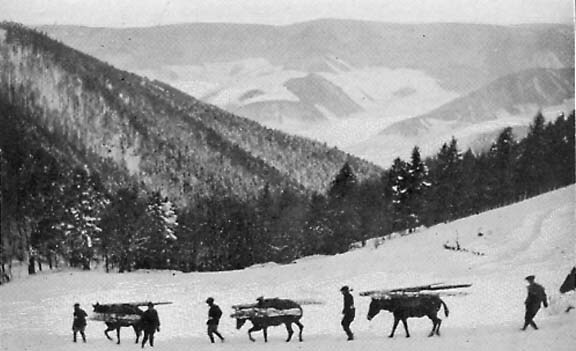 The mountain roads were frozen; our cars slipped and twisted and skidded from cliff to precipice, avoiding great ammunition wagons, frightened sliding horses and pack-mules, and hundreds of men, who, in the great rush, were considered able to drag themselves to the hospitals unaided. I was on my way to the nearest post to the lines on the afternoon of the 27th when I was ordered to stop. Shells were falling on the road ahead and a tree was down across it. I waited a reasonable time for its removal and then insisted on going on. At that time I had never been under fire. For two kilometres I passed under what seemed like an archway of screaming shells. Branches fell on the car. At one time, half stunned, half merely seared, I fell forward on the wheel, stalled my engine, and had to get out and crank up, with pandemonium around me. Then I found the tree still down. For an hour I lay beside my car in the road, the safest place, for there was no shelter. We were covered with débris. Then dusk came, and as we must return from that road before dark, I tried to turn. The road was narrow, jammed with deserted carts and cars, and with a bank on one side, a sheer drop on the other. I jerked and stalled and shivered and finally turned, only to discover a new tree down behind. There could be no hesitating or waiting for help --- we simply went through it and over it, in a sickening crash. And then our ordinary adventures began. There we had lived and eaten and sometimes slept during the attack. The soldiers of the ----th had practically adopted each and all of us, giving up their bunks and their food and wine for us at all times and sharing with us the various good things which had come from their homes scattered from the Savoie to Brittany. No lights were ever shown there; no shells had fallen anywhere near. On January 8, the first ones came, shrapnel and asphyxiating gas. Four men were killed. One of the brancardiers came out and stood in the road, unsheltered, to warn any American car that might be coming up. A car broke down and I took 161 up that afternoon. We climbed the road among the shells, and near the top a man was struck just in front of us. I picked him up and on the way down again we went through a running fire. Two days later our hut up there was struck and demolished. So we moved. The work during the past month has put an unusual strain upon every part of our cars. But it saves the wounded hours of painful travel, and is appreciated in the most touching manner by men as brave and uncomplaining as ever did a soldier's duty, who have more to face than is probably generally realized. All the horrors of modern war are known here---high explosives, burning oil, asphyxiating gases, and in addition it is no gentle country to campaign in. There are long marches and hard climbs, where the wind blows cold, and it rains, and soon will snow, for days at a time. It is, indeed, a privilege to see the courage and good cheer of the men who are facing these things. The ravitaillement may be delayed; their allotted period in the water-soaked trenches may be doubled, or trebled, and yet it is always "Ça ne fait rien." It is a keen satisfaction to think that your work will help to make the horrors of cold weather a little less painful for such as they. We now received our first taste of winter, and my first experience made me put more faith in the rumors of large falls of snow than an American likes to concede to any country but his own. I was sent to our regular station at the poste de secours at Mittlach. It was the farthest away, up the mountain to Treh, along the bare crest for five kilometres and then twelve more on a winding, narrow road to the valley of Metzeral. There was little work then, and the car that I was to relieve got a trip late that night in what was, even at Mittlach, a terrific rainstorm. The next morning it continued raining, but I could see the peaks of the mountains covered with snow; still no wounded, so I waited, a little anxious, as no relieving car had arrived. Late in the afternoon, just after dark, the familiar sound of a Ford brought me out of the poste de secours, and I found Rice, with his car covered with snow which even the rain had n't yet melted. 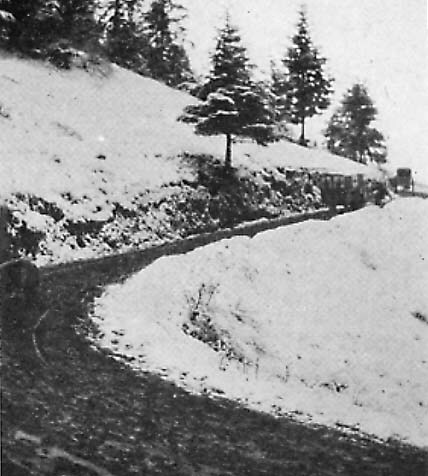 His story was of helping the car I had relieved, all morning, in their efforts to pull it on to the road from which a heavy ammunition wagon had pushed it, neither vehicle being able to stick to the icy road. Farther on he had met continual snowdrifts. His eagerness to bring me chains, my only chance of getting up, persuaded him to keep on, and he eventually got through with everybody's help on the road. We decided to wait until the storm was over, our only alternative, and proceeded to make ourselves as comfortable as we could, which means a stove, somewhere to sleep, and plenty to read and smoke. It was four days before the snow let up and we had visions of a long and lonely winter, but as soon as the storm broke we started up, and, as it proved, in the nick of time, as the five kilometres along the crest were again swept by snow and sleet and drifts were beginning to form. 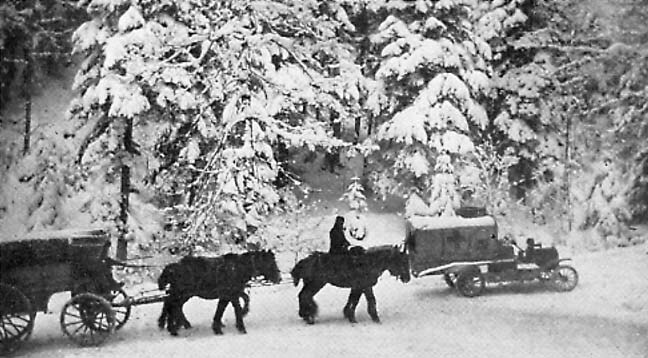 The Mittlach service had to be abandoned after this, although in late November and early December a car could go through, but it was impossible to assure the service and it was found better to have sleighs and wagons do the work. The cold has been intense during the last few days and breaking the ice to wash is a usual morning performance. A temperature of 5° below zero Fahrenheit does not facilitate starting a Ford ambulance that has been standing out all night; in fact, almost every morning it takes about fifteen minutes to start each car with the aid of hot water, hot potiers, and other appliances that the inventive genius of our various drivers supplies. On either side of you a wilderness of snow. Take your eyes off the road and you seem to be in the great forests of a new country. Look back on the road and turn sharply to avoid the first of a convoy of brand-new American tractors, or a maze of telephone wires with their red-and-white labels which have been pulled from their supports by the snow. The great rocks and banks resplendent with their coating of ice, the trees, the snow, the occasional deer, fox, or rabbit contrast strangely with the road --- the narrow, winding, mountain road serving for almost all forms of traffic, save the railroad, known to man. Mules, mules, mules, always mules, with their drivers hanging on to the beasts' tails. With the change of conductors No 170 has fallen upon evil times. She has carried meat and bread for the Section, and even coal; she has run through miles of snowstorm to bring relief to those who were suffering from toothache, scarlatina, or mumps; and she has patiently borne permissionnaires from hospital to railroad station; but the shriek of shot and shell has become entirely unfamiliar to her ears. At first it was the fault of the conductor, who had never conducted before reaching Bordeaux, and only some half-dozen times between leaving Bordeaux and arriving in Alsace. He was not adjudged capable of conducting up any mountain in general nor up the slopes adjoining Hartmannsweilerkopf in particular. He went up once or twice without 170, to inspect and experience, but it is an experience of which a little goes a long way when not prompted by duty. Afterward it was the fault of those who sit in the seats of the mighty, and still is, and apparently will remain so; but at no time was 170 to blame. We left Alsace one morning early in February when the valleys were filled with tinted mist and the snowy hill-slopes were glowing pink with sunrise, and we hated doing it. Various reasons have been offered for our departure by various persons in authority, --- but none of them satisfactory and convincing, --- and we still look back upon it as the Promised Land. We formed a convoy of twenty-three cars, in which 170 was placed immediately behind the leader --- an arrangement to which twenty-one persons objected. 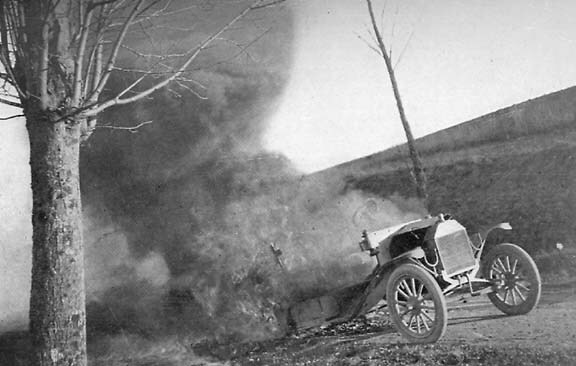 Every time the side boxes came open and the extra tins of gasoline scattered over the landscape, or when the engine stopped through lack of sympathy with the engineer, three or four cars would manage to slip by. It was a sort of progressive-euchre party in which 170 never held a winning hand. No one concerned had the least idea whither we were headed. The first night we spent at Rupt, where there is an automobile park. We took it on hearsay that there was an automobile park, for we left the next morning without having seen it; but when two days later we joined the Twentieth Army Corps --- the Fighting Twentieth --- at Moyen, we were reported as coming straight from the automobile park at Rupt. Consequently we were assumed to be ready for indefinite service "to the last button of the last uniform," and when we had explained that mechanically speaking our last uniform was on its last button the Fighting Twentieth shook us off. However, we spent a week at Moyen --- in it up to our knees. The surrounding country was dry and almost dusty, but Moyen has an atmosphere of its own and local color --- and the streets are not clean. Yet to most of us the stay was intensely Interesting. It lies just back of the high-water mark of German invasion, and the little villages and towns round about show like the broken wreckage tossed up by the tide --- long streets of roofless, blackened ruins, and in the midst the empty skeleton of a church. The tower has usually been pierced by shells, and the broken chimes block the entrance. Nothing has been done to alter or disguise. The fields surrounding are pitted with shell craters, which have a suggestive way of lining the open roads; along the edge of the roads are rifle pits and shallow trenches filled with a litter of cartridge boxes and bits of trampled uniform and accoutrement, blue and red, or greenish gray, mixed together, and always and everywhere the long grave mounds with the little wooden crosses which are a familiar feature of the landscape. It lacks, perhaps, the bald grim cruelty of Hartmannsweilerkopf, but it is a place not to be forgotten. From Moyen we moved on to Tantonville, a place not lacking in material comforts, but totally devoid of soul; and from there we still make our round of posts --- of one, two, or four cars, and for two, four, or eight days. In some, the work is fairly constant, carrying the sick and second-hand wounded from post to hospital and from hospital to railroad; in others, one struggles against mental and physical decay --- and it is from the latter of these in its most aggravated form that the present communication is penned. At Oeleville, we saw the class of 1916 called out, --- brave, cheerful-looking boys, standing very straight at attention as their officers passed down the line, and later, as we passed them on the march, cheering loudly for " les Américains " --- and so marching on to the open lid of hell at Verdun. The roads were filled with soldiers, and every day and all day the trooptrains were rumbling by to the north, and day after day and week after week the northern horizon echoed with the steady thunder of artillery. Sometimes, lying awake in the stillness of dawn to listen, one could not count the separate explosions, so closely did they follow each other. The old man who used to open the railway gate for me at Dombasle would shake his head and say that we ought to be up at Verdun, and once a soldier beside him told him that we were neutrals and not supposed to be sent under fire. I heard that suggestion several times made, and one of our men used to carry in his pocket a photograph of poor Hall's car to refute it. There was a momentary thrill of interest when a call came for four cars to Baccarat --- a new post and almost on the front; there was an English Section there in need of assistance, and we four who went intended to "show them how." But it seemed that the call had come too late and the pressing need was over; the last batch of German prisoners had been brought in the day before and the active fighting had ceased. 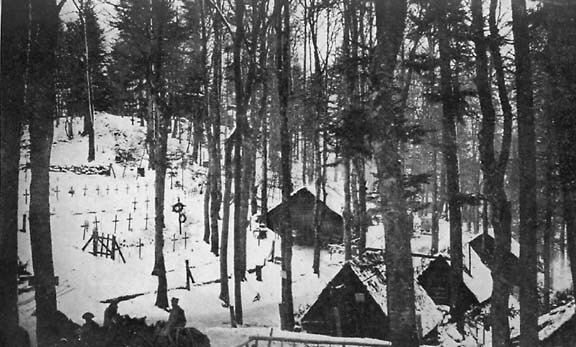 We stepped into the long wooden cabin where they waited --- the German wounded ---and they struggled up to salute --- a more pitiful, undersized, weak-chested, and woe-begone set of human derelicts I hope never to see again in uniform; and as we stood among them in our strong, warm clothes, for it was snowing outside, all of us over six feet tall, I felt suddenly uncomfortable and ashamed. The officer in charge of the administration said that a car was needed to go down the valley to Saint-Dié, but we must be very careful for Saint-Dié was under bombardment. Once we were startled at lunch time by an explosion near the edge of town. Three of us stepped to the door. We were eating the rarity of blood sausage and the fourth man kept his seat to help himself from the next man's plate. As we looked out there came a second explosion a little farther off, and then in a few moments a telephone call for an ambulance, with the news that a Taube had struck a train. When I reached the place the train had gone on, carrying ten slightly wounded to Lunéville, and I brought back the other two on stretchers --- one a civilian struck in a dozen places, but otherwise apparently in excellent health and spirits; the other was a soldier in pretty bad shape. It must have been excellent markmanship for the Taube, since we had seen nothing in the clear blue sky overhead nor heard the characteristic whir of the motor, and yet both shell craters were very close to the tracks. In Alsace they were constantly in sight, but seldom attacked and almost never scored a hit, while the French gunners seemed perfectly happy to fire shrapnel at them all afternoon with the same indecisive result. One could not even take the white shrapnel clouds as a point of departure in looking for the aeroplane ---though the French artillery is very justly famous for its accuracy of fire. In this instance as in all air raids the success scored seemed pitifully futile, for it was not a military train, and most of the wounded were noncombatants. It had added its little unnecessary mite of suffering, and of hatred to the vast monument which Germany has reared to herself and by which she will always be remembered. You can little imagine how lonely it is here under the black, star-swept sky, the houses only masses of regular blackness in the darkness, the street silent as a dune in the desert, and devoid of any sign of human life. Muffled and heavy, the explosion of a torpedo inscribes its solitary half-note on the blank lines of the night's stillness. I go up to my room, and sigh with relief as my sulphur match boils blue and breaks into its short-lived yellow flame. Shadows are born, leaping and rising, and I move swiftly towards my candle-end, the flame catches, and burns straight and still in the cold, silent room. The people who lived here were very religious; an ivory Christ on an ebony crucifix hangs over the door, and a solemn-eyed, pure and lovely head of Jeanne d'Arc stands on my mantel. What a marvellous history ---hers I think it the most beautiful, mystic tale in our human annals. Silence --- sleep --- the crowning mercy. A few hours go by. "There is a call, Monsieur Shin --- un couché à -----. I wake. The night clerk of the Bureau is standing in the doorway. An electric flashlight in his hand sets me a-blinking. I dress, shivering a bit, and am soon on my way. The little gray machine goes cautiously on in the darkness, bumping over shell-holes, guided by the iridescent mud of the last day's rain. I reach a wooded stretch --- phist! a rifle bullet goes winging somewhere. A bright flash illuminates the road. A shell sizzles overhead. I reach the poste de secours and find a soldier in the roadway. More electric hand-lamps. Down a path comes a stretcher and a man wounded in arm and thigh. We put him into the wagon, cover him up, and away I start on my long, dark ride to the hospital, a lonely, nerve-tightening ride. The voice of war is the voice of the shell. You hear a perfectly horrible sound as if the sky were made of cloth and the Devil were tearing it apart, a screaming undulating sound followed by an explosion of fearful violence, bang! The violence of the affair is what impresses you, the suddenly released energy of that murderous burst. When I was a child I used to wander around the shore and pick up hermit crabs and put them on a plate. After a little while you would see a very prudent claw come out of the shell, then two beady eyes, finally the crab in propria persona. I was reminded of that scene on seeing people come cautiously out of their houses after a shell had fallen, peeping carefully out of doorways, and only venturing to emerge after a long reconnoitring. I am staying here. It was my design to leave at the beginning of the year, but why should I go? I am very happy to be able to do something here, very proud to feel that I am doing something. In times to come when more Americans realize their lost opportunity, there will be many regrets, but you and I will be content. So wish me the best. Not that there is anything attractive to keep me here. To live continually under shell fire is a hateful experience, and the cheerless life, so empty of any domesticity, and the continuous danger are acid to any one with memories of an old, beloved New England hearth and close family ties and friendships. To half jest, I am enduring war for peace of mind. How lonely my old house must be when the winter storms surge round it at midnight. How the great flakes must swirl round its ancient chimney, and fall softly down the black throat of the fireplace to the dark, ungarnished hearth. The goblin who polished the pewter plates in the light of the crumbling firebrands has gone to live with his brother in a hollow tree on the hill. But when you come to Topsfield, the goblin himself, red flannel cap and all, will open the door to you as the house's most honored and welcome guest. A fusée éclairante has just run over the wood --- the bois de la mort --- the wood of the hundred thousand dead. And side by side with the dead are the living, the soldiers of the army of France, holding, through bitter cold and a ceaseless shower of iron and hell, the far-stretching lines. If there is anything I am proud of, it is of having been with the French army --- the most devoted and heroic of the war. I was stationed at one of our postes de secours the other night during a terrible rainstorm. The wind does blow on top of these mountains when it begins! About bedtime, which is at 7.30 (we eat our dinner at 4.30 --- it is pitch dark then), a call came from one of our postes three kilometres nearer the line. There was a captain wounded and they asked me to go for him. I cannot speak French well, but I made them understand. The poste is at the foot of the mountain, hidden from the Boches by the trees in the woods only. At night we cannot use lights, for the Germans would see us easily, and then there would be a dead American in short order. Of course, I told them I would go, but it would be dangerous for the blessé. I could jump out in case I should run into a ravine, but I could not save the man on the stretcher if anything happened. They understood, and, after about half an hour, we heard another knock on the cabin door, and they brought the captain in --- four men, one on each corner of a stretcher. They put him on the floor, and in the lantern light of the room (made of rough timbers) one could see he was vitally stricken by the death color of his face and lips. He had his full senses. It was my duty then to take him down the opposite slope of the mountain to the hospital. I started my car and tried to find my way through the trees in the dark. The wind was almost strong enough to blow me off the seat, and the rain made my face ache. The only light I had was that of the incendiary bombs of the French and the Germans at the foot Of the hill, about one and a half kilometres away. These bombs are so bright they illuminate the whole sky for miles around like a flash of lightning. I must admit my nerves were a little shaken, taking a dying man into my car under such conditions, almost supernatural. It did seem like the lights of the spirits departing mixed with the moaning wind and the blackness of the night, and the pounding of the hand-grenades in the front lines so near. They gave me another blessé with the captain. This man had been shot through the mouth only, and was well enough to sit up in back and watch the captain. I could use my lights after I had passed down the side a short distance out of sight of the lines. We must run our motors in low speed or we use up our brakes in one trip. All the poor capitaine could say during the descent was "J'ai soif," except once when he requested me to stop the car, as the road was too rough for him, and we had to rest. When we reached the hospital, I found a bullet had struck one shoulder and passed through his back and out the other shoulder. He also had a piece of shell in his side. A few hours before he had walked back from the trenches into the woods to see a position of the Germans; they saw him --- and seldom does a man escape when seen at fairly close range. He was vitally wounded. I climbed up the mountain watching the fire-flashes in the sky, feeling pretty heavy-hearted and homesick, but with strengthened resolve to help these poor chaps all I possibly could. The next day I had another trip from the same station on the mountain to the same hospital at five o'clock in the afternoon --- then dark as midnight. The sisters told me the capitaine was better; the ball bad not severed the vertebra and there was hope for him. They told me also that the general had arrived and conferred upon him the Cross of the Légion d'Honneur. It was reassuring to hear that he was better and had distinguished himself so well, and I went back up the trail this night with a lighter heart. I had felt really guilty, for I did not have a thing in my car to give him the night before when he asked me to stop the car and said, "J'ai soif." Never did I want a spoonful of whiskey more and never have I regretted not having it more. I could not give him water --- he had some fever; besides, though there are many streams of it running down the mountain, no one dares to touch it. Water is dangerous in wartime, and we have all been warned against it. I was called the next morning for the same trip and when I reached the hospital at eight o'clock it was still raining --- now for three days! I met Soeur Siegebert in the hall --- carrying her beads, her prayer-book and a candle. She is one of the good nuns who always gives me hot soup or tea with rum in it when I come in cold, wet, and hungry ---and many times I and the others have blessed her! My first question was: "Comment ça va avec le capitaine ce matin ? " All she said and could say was "Fini." He had passed out a short time before I got there. He was only thirty years old, tall and handsome, and they say he led a whole battalion with the courage of five men. A little later I stepped into the death chamber in a little house apart from the hospital. It was cold, wet, and smelled strongly of disinfectant, just as such places should, and in a dim, small room lighted by two candles, upon a snowy white altar made by the nuns, there he lay on a bier of the purest linen beautifully embroidered, whiter even than the pallor of his features and hands, and as I came near him the only color in the room was the brilliant touch of red and silver in his Légion d'Honneur medal, which was pinned over his heart. His peaceful expression assured me he was happy at last, and made me realize that this is about the only happiness left for all these poor young chaps I see marching over these roads in companies for the trenches, where their only shelter is the sky and their only rest underground in dug-outs. When they go into the trenches they have slim chance of coming out whole again, and they pass is along the road in companies with jovial spirits, singing songs and laughing as though they were going to a picnic. I see them come back often, too; they are still smiling but nearly always in smaller numbers. What can they have in view when they see their numbers slowly but surely dwindling! I marvel at their superb courage!